Deep in the jungles of Mystery Island lives a strange masked Yurble. Long ago, this Yurble was just a regular Neopet... until one day he stumbled upon some very odd coloured stone blocks in the ruins of Geraptiku. The Yurble discovered that when he arranged the blocks in 2x2 squares of the same colour, they would disappear. Unable to figure out what caused this phenomenon, the Yurble decided that the only possible answer was that he was a mighty witch-doctor. He donned the fearsome tiki mask he wears today and has been 'magically' crushing the coloured stone blocks ever since. Fortunately, it�s not magic that makes the blocks disappear... not the Yurble's magic anyway. Why not try flipping a few stone blocks yourself? 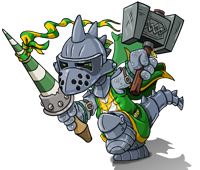 Use Petpets to do some cannon-training. Follow and try to repeat the cheeky Techos pattern. Come up with as many words in the time limit as you can. Spell words in order to escape the ancient tomb. Send Pompadour's Petpets on a perilous plunge for treasure! This clash of magicians is sure to cast a spell over you! Show those faerie racers who's the greatest of them all! Help Hagan defend his castle against Skarl's toy invasion! Use your catapults to fight off the Snow Beasts and Lupes! Perfect putting in the plains of Tyrannia! You are about to send feedback on Goparokko. We would appreciate it if you could give the game a rating out of 10, and also tell us any additional comments you may have. Thank you for your feedback on Goparokko.